It’s no surprise that New Super Mario Bros. was a runaway hit on the DS. Longtime Nintendo fans loved the nostalgia value and familiar gameplay of the first true 2D entry in the series since 1995’s Yoshi’s Island, and a new generation of gamers discovered why the plumber is the most iconic character in the industry. 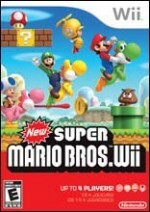 With the success of the Wii and its focus on local multiplayer gameplay, New Super Mario Bros. Wii is a no-brainer. Take the classic series that gamers young and old adore, introduce four-player gameplay for the first time, and watch it fly off the shelves. New Super Mario Bros. Wii takes the stellar core gameplay of the DS version, introduces far more creative and challenging stages, and includes riotous multiplayer gameplay. I hesitate to call it co-op gameplay, simply because of the sheer number of times you’ll accidentally (or sometimes, intentionally) screw your friends over in hilarious fashion. Mario games focus on running and jumping; and coordinating difficult platforming segments with three other people oftentimes means at least one of them is going to get stomped in mid-air, sending them to their death. Once that unlucky player comes back to the action, he or she can easily get revenge by picking up their killer and throwing him or her directly into a Goomba. It’s these chaotic moments that result in punched shoulders or players getting banned from future multiplayer sessions. The Wii’s latest Mario game is far more than just a nostalgia act, as the level of quality is on par with the best from the NES and SNES days. Some stages are simple endeavors that give you experience with a new power-up, while others truly test your platforming skill. Later levels fill the screen with Bullet Bills, cannonballs, angry Crowbers, and parachuting Bob-ombs, ensuring that you won’t have a moment’s rest. Even the airships from Super Mario Bros. 3 return, complete with their memorable and ominous background music. Once you reach the end of the game, you’ll be treated with what might be the best boss fight in any 2D Mario title. Playing with a few friends adds a new element to the Mario experience, but it’s not without its frustrations. Accidentally falling to your doom is funny when you have a healthy stash of lives, but later stages require precise platforming, and it’s much harder to perform quick, accurate jumps when there are three others trying to do the same thing. Some gamers may be concerned about the addition of motion control, but like Super Mario Galaxy the game implements it sparingly and it’s never too gimmicky. Quick shakes let you pick up items or spin jump, and tilting the controller manipulates platforms and cannons. My only real complaint with the motion controls is that their inclusion means this game can’t be played with the Classic Controller. It’s a shame, as it would have been a perfect fit. There are enough buttons on the Classic Controller to handle the game’s various actions, and the L and R shoulders could have handled the platform tilting. It doesn’t matter if your first gaming system was the NES or DS; New Super Mario Bros. Wii proves that 2D platformers are still a blast. Longtime gamers will love the countless throwbacks to previous titles, and the multiplayer gameplay is fantastic (albeit hectic) fun for everyone. quality is on par with the best from the NES and SNES days.